The “Sparrows” word is a club-sponsored bird walk at Osceola Island, downstream and in sight of the South Holston Dam. This time of year the northern ducks start to show up along with resident eagle and kinglets. The “Soup” is the annual soup and bean dinner hosted by the South Holston Ruritan whose clubhouse is about a mile or so from the Weir Dam. This was my firs time in 30-plus years ever going to Soup and Sparrows and I admonish myself for not going before. Between my guest and I, we had: Turkey and Wild Rice Soup, Bear Soup, Venison Chili, Vegetable Soup, Cheeseburger Soup. All home made. All you can eat plus a drinks and desserts (yummy desserts). I don’t know how many people came to this but the business was pretty constant. The doors opened at 11:00 and they so much traffic it takes two shifts. Ruritan is to be congratulated on such fine meal and good hosts and if you can be in this neck of the woods the last Saturday in January of 2020, join us. 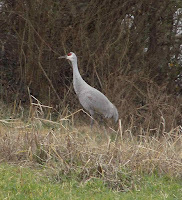 A genus (Grus canadensis) we don’t get much here in upper east Tennessee is crane, neither the whooping crane nor the Sandhill crane. Sandhill crane have been seen here once in a while but with no regular sightings. They congregate over winter not far from here, at Hiwassee Refuge about 40 miles north of Chattanooga where the Hiwassee River and the Tennessee River meet in the big middle of Lake Chickamauga. This gathering is in the 20,000 population range, give or take a thousand. We are probably near the most south-easterly edge of the breeding grounds. The migration is west of north away from here so the few see got lost. The huge flock is a delight to see. The crane are noisy, busy, and beautiful. However, you have to get there at the right time. By late February they’re gone. Headed north. You’ll have to wait until next year. This great-blue heron was having a nice sunny day of it at Davis Dock on Boone Lake. He didn’t seem particularly in a hurry to feed and the several ducks around him were ignored. Two days before, we’d just had an early snow/rain mix blow through on the trailing edge of the winter’s first severe snow storm on the east coast. The result was an event called a “fallout” where a storm meets flocks of birds causing the birds, mainly waterfowl, to drop down to our lakes to ride out the storm and rest. The thing of it is, as early as the next day, given a clear enough sky, they’re gone! This fallout was of record proportion. I wish I’d been there. 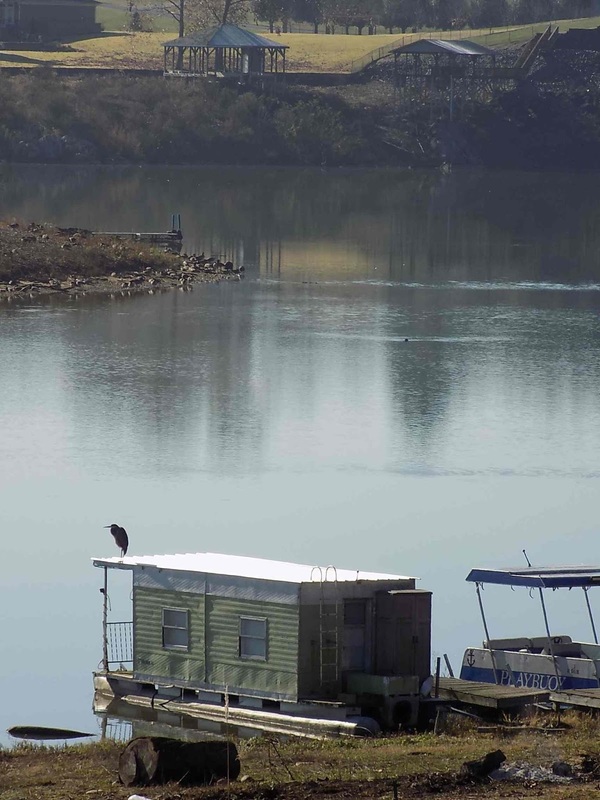 We are fortunate in being in the path of the migration and having large enough lakes to be inviting and accommodating. This was maybe my third or fourth trip to the Outer Banks of North Carolina. Doesn’t matter, repeat trips to the Outer Banks are always different. It’s a long drive but the interstate makes it very doable. The last 100 miles is four-lane, then two-lane, then four-lane again until you cross the Roanoke Sound and enter the banks just below Nags Head at a junction called Whalebone. This time the weather was just plain hot. I remember one time when it was mild temperature and gale winds. All I did was sweat, this time around. This is a famous strip of sand. Kill Devil Hill is to the left (north) about 10 miles. It’s just a big sand pile but I suppose you could say the trip from the trip to the moon started here. Of course, Hatteras is known for the shipwrecks that line the shore. I’d hate be blown off course and towards the Cape. It would be a slow, wet death. Below Hatteras is Ocracoke Island accessible by a free ferry. Below Ocracoke is Cape Lookout which is pretty much off limits to most of us. You are on about the same latitude as the northern half of Tennessee. There are two distinct birding districts in this part of North Carolina. One is the Outer Banks themselves, of course. This ribbon of sand is fairly uniform for its entire length. Seasonal changes create the diversity. 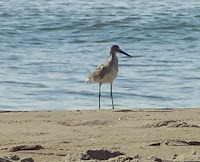 The coast is, of course, a major flyway so return birding trips are probably best done at different seasons. We were on the bottom two-thirds of the Outer Banks and what we saw was predictable and regular. There is a common grouping of birds called goatsuckers that includes the nightjars (whip-poor-will) and the common nighthawk. The common nighthawk is not all that common around Johnson City. From June through July they come out just before sundown and swoop and dive almost like swifts catching insects on the wing. The reports are the population is declining slowly but steadily. There has been a change to how we make roof tops (are we moving away from flat gravel?) and how we clear land. Like all insectivores, nighthawks are directly susceptible to damage if they are around insecticides. They are easy to spot: tubular body, swept-back wings, quick flutter than glide, agile. If you can get a really good look pay attention to a white patch about mid-wing, one of the few field marks. The call is some combination of a squeak, squeal, splatter, and spit. The call comes in a short spurt almost like communications between individuals instead of mockingbird-like love songs. Maybe, if the swifts are out and about the nighthawks might be, too. Nighthawks don’t seem to stay overhead long, either. I suppose as the meal moves with the wind so do the nighthawks. And they can be very localized. I’ve had them in downtown but not on campus and then over campus and not downtown, those two places not two miles apart, if that far. I keep hoping to spot them at the night games at Cardinal Park. Best of luck would be a nighthawk just before sundown and a bat just after sundown! I don’t remember when the eagles were hacked on South Holston Lake. It had to have been 20-25 years ago at least. But, they’re back! In good quantities. We have them now regularly on the scheduled five-county counts and when birding in Sullivan County, Tennessee, we expect to see them. Still, it’s quite a sight. We are lucky to have a nesting pair across Boone Lake from Winged Deer Park, in Johnson City, off 11E where it crosses the lake. This has become something of a local phenomenon since the nest is also linked to a webcam on our college homepage “www.etsu.edu” and viewed, I’m told, by millions. If you are fortunate enough to be at Winged Deer Park keep your eyes peeled. They have become celebrities in the paper and the TV news. At the senior center the “eagle cam” is on most of the time. We are becoming eagle experts. But, one of these days the parents will not return and the nest will fall to the elements. Or, the host tree will collapse. It’s the way it all works. The Genus species is Haliaeetus leucocephalus. Hals and aetus combind for sea-eagles in the Greek. Most of us might be more acquainted with Aquila which is the Latin for eagle and is also the name of the constellation. Leuko is from the Greek for white and cephala is from the Latin for head. Alba is also used many times for white but also for first. Blanca is white but more like “pale” as in European skin tones in the Latinate languages. We’ve watched young grow up and we’ve watched the nest get visited and damaged and rebuilt. The young take five years to mature. I keep wondering how long the pine the nest is in will last under the load of the nest. In an earlier post I mentioned one time while at South Holston dam we saw seven mature and immature eagles cavorting out over the lake, diving and wrestling. I don’t recall if any of us had ever seen such a sight but it was spectacular. If you get out an watch enough the rewards are more than just tick marks on a list. The 75th Annual Carter County Christmas Bird Count is in the record books.That’s a pretty good string of successful counts. We had 6 parties, 26 observers, and a new all-time high species count of 85. The 30-year running average is 72. While a bit chilly to start with by noon we had an uncommonly nice winter’s day for north east Tennessee. There was some snow still on the ground higher up but in town folks were out in t-shirts and flip-flops. This old guy was not one of them. The group I most often bird with will tell you I am quick to chill. The count area is a 15-mile diameter centered on Wilbur Dam so that takes in almost all of Elizabethton, a long ways up Stoney Creek towards Shady Valley, and most of Watauga Lake to the east. As it always is, some species just don’t want to show up. For example, for a 150-square mile area we had a total of 14 vultures. But we also hit every woodpecker and quite a few of the ducks. This is about the right time in the season for more ducks and we have been seeing more arrive either additional species or additional individuals. We had almost 300 bufflehead which would be a fraction of them for the larger five-county area. The count produced many singles: white-fronted goose, Eur-Asian collared dove, barred owl, blue-headed vireo, red-breasted nuthatch (a real surprise), red-winged blackbird, catbird, brown thrasher, Eastern meadowlark (although upwards of 30 were spotted a week before outside the area). Bird watching is like that. From time to time in a given area it hit and miss and other times in the same area over a season all kinds of varieties come through. Of course, in this small area were only thirteen-hundred starling. I’ve noted here some of the more interesting finds (or misses) as noted by Rick Knight who is the compiler of record for the Herndon Chapter: Red-winged blackbird found 9 of last 25 years; Eastern meadowlark becoming very hard to find on this CBC; Brown-headed cowbird found 3 of last 25 years; Red-shouldered Hawk found 6 of last 25 years, uncommon in northeast Tennessee. Perhaps the most notable miss was American coot. Our group (Bryan Stevens, Chris Soto, and Brenda Richards) collected 75 pipits in a corn field. Pipits have been on the count only three times in the last 25 years. That was my second pipit sighting of the calendar year. I’ve gone full years without seeing them. We stumbled upon a collard dove not half-a-mile as the crow flies from where they’d been seen several times in the summer. This count, they had none and we had one. 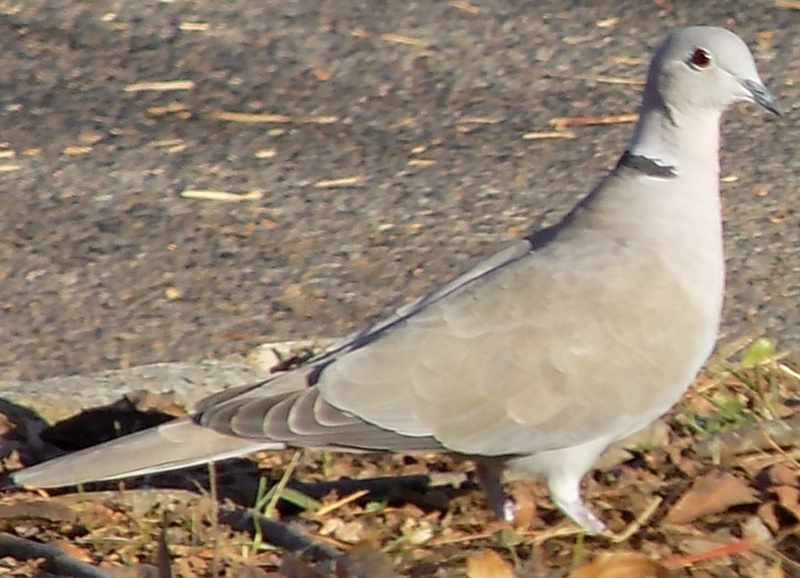 The collared dove (pictured) lacks the pattern of a mourning dove and of course has the distinctive black collar around the back of the neck. We were excited, to say the least. 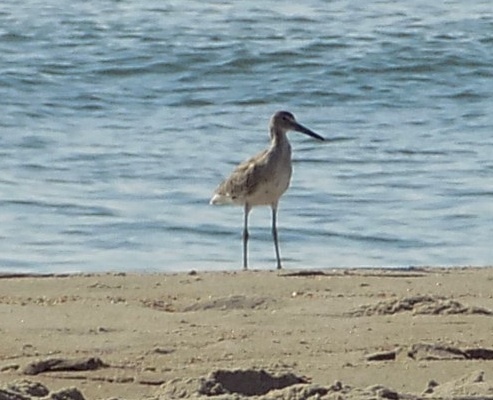 You can also expect some birds to be around that are relatively new to the area. Perhaps most notably is Bald eagle. Rick’s note is that we’ve seen Bald eagle in 20 of the last 25 years but only once before that. About 25 years ago was when the hacking program began on South Holston Lake and has paid off nicely. If you need further convincing of that, check out www.etsu.edu for the eagle cameras. Also, Herndon hosts a website at https://groups.yahoo.com/neo/groups/HerndonBirdClub/info where more details are listed.